Once during his action phase, Xun Yu can compete with any character with more health. If Xun Yu wins, he can select a player within the target's attacking range and the target deals one unit of damage to that player. If Xun Yu loses, the target deals one unit of damage to Xun Yu. For each unit of damage that Xun Yu receives, he can select one character. This character then draws cards until the number of cards in their hand is equal to their maximum health limit. When Xun Yu uses "Rouse the Tiger," he can select himself to be damaged if the target has Xun Yu in their attacking range. "Rouse the Tiger" and "Eternal Loyalty" can be used in unison. If Xun Yu loses the competition, he will take one unit of damage and then can choose to activate "Eternal Loyalty" as a result. Remember, "Rouse the Tiger" causes direct damage. This damage cannot be avoided by playing an Escape or Negate. "Eternal Loyalty" activates once per unit of damage received, not per instance. For example, if Xun Yu takes two units of damage, he can 'refill' two players' hands. "Rouse the Tiger" can only be used on a target who have at least one hand card, as the Compete mechanism requires this. Xun Yu is a great team player. "Eternal Loyalty" allows him to keep his team well-stocked with hand cards. This can act as a deterrent against enemies damaging him as well. "Rouse the Tiger" can be used to damage another character or to 'refill' a teammate's hand. When using this power on enemies, it is possible to play mind games and leave them guessing as to what your true intentions actually are. "Rouse the Tiger" can get around defensive abilities such as Zhuge Liang's "Empty City" and Zhang Jiao's "Lightning Strike." It also allows Xun Yu to bypass retaliatory abilities such as Sima Yi's "Feedback," Xiahou Dun's "Unyielding," Ma Su's "Bottomless Tears," Cai Wen Ji's "Heartbroken," and Fa Zheng's "Grudge" which target the player that is source of damage, which would not be Xun Yu is this case. When Xun Yu and his allies have 'full' hands, "Eternal Loyalty" becomes less useful and less of a deterrent. As a result, Xun Yu can become the target of enemies in the first round of the game since everybody has a lot of hand cards. Although "Eternal Loyalty" activates on a 'per damage' basis, there may not be more than one person who could benefit a lot from being refilled (i.e. there may not be more than one person who is 'missing' more than one card in their hand). "Rouse the Tiger" is useful, but there are limits on what Xun Yu can do with it. If he wants to damage a particular character, there has to be another character who can reach this character who has more units of health than Xun Yu. Also, this character must be able to lose to Xun Yu when he activates "Rouse the Tiger" to compete with them. If the only character that fits these criteria is an enemy, then Xun Yu may run into some trouble, as they will not willingly cooperate with Xun Yu's plans. Xun Yu is weak in one-on-one situations. "Rouse the Tiger" can only be used to hurt Xun Yu in these cases. Also, "Eternal Loyalty" is not as useful when Xun Yu does not have a team. When Xun Yu uses this power exclusively on himself, the drawing power is quite low as Xun Yu has a maximum health level of three. Liu Bei - Xun Yu and Liu Bei make a great team. Liu Bei can give away all of his hand cards, damage Xun Yu, activate "Eternal Loyalty," and refill his hand. This process can then repeat itself if Liu Bei draws the right cards. This is particularly powerful when Liu Bei is the king and has an extra unit of health. 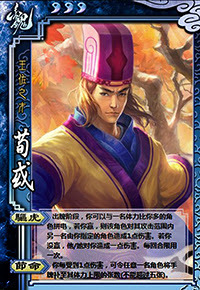 Yan Liang & When Chou - When these two activate "Dueling Heroes," they can use all of their hand cards then Duel Xun Yu to 'refill' their hand. Their power is still in effect, so they can continue to Duel their opponents. 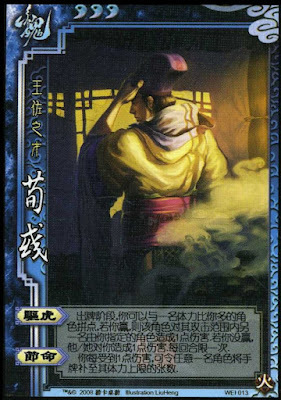 Yuan Shu - Yuan Shu frequently runs out of hand cards by the nature of his "Trite Rule." Xun Yu can keep him well stocked with "Eternal Loyalty." Yuan Shao - "Random Strike" is expensive for Yuan Shao, but Xun Yu can keep him well stocked with cards each time he is hit with this power. This allows Yuan Shao to repeatedly use this power and wear down his enemies during his turn. Multiple Damage Dealers - Characters that can easily deal multiple units of damage can hurt Xun Yu the most. Even though "Eternal Loyalty" activates on a 'per damage' basis, there is not always more than one person to 'refill'. Zhang Chun Hua - Zhang Chun Hua's "Unfeeling" does not activate Xun Yu's "Eternal Loyalty." Ma Dai - Ma Dai's "Sneak Attack" can be used to reduce Xun Yu's (or his ally's) maximum health level and hence reduce the power of "Eternal Loyalty." Additionally, Xun Yu cannot activate "Eternal Loyalty" when Ma Dai's "Sneak Attack" is successful, as this does not constitute Xun Yu taking damage. King Xun Yu is a good king pick. "Eternal Loyalty" is useful because he can always ensure that he will have a full hand of cards. However, players who choose him as a king should beware that this power is not useful early in the game. The rebels may try to kill him quickly before he and his teammates run out of hand cards. It is important for the teammates to keep him healthy early in the game. Loyalist Xun Yu is a good loyalist because he can keep the king's hand full. He is particularly good when Liu Bei is the king. Rebel Xun Yu is also a good rebel choice. "Rouse the Tiger" can be used to target the king. It can also be used to force the king to kill the loyalist and lose all of his cards as a result. Spy Despite being able to handle the other three roles remarkably well, Xun Yu is a poor spy choice. In order to be effective, Xun Yu needs to have a team. While "Rouse the Tiger" can be used to trick a player into hurting a teammate, realize that this ploy will only work once. The other players will not trust you for the remainder of the game. Also, if Xun Yu somehow manages to secure a one-on-one battle with the king at the end of the game, he will have a difficult time winning unless the king has few units of health remaining. Xun Yu is not a beginner-friendly character, but he is a lot of fun in high-level play. He is one of the most powerful team players in the game. Xun Yu and his teammates can feel free to use all of their hand cards since Xun Yu can refill their hands easily with "Eternal Loyalty." "Rouse the Tiger" also gives Xun Yu some tactical options. When using Xun Yu, do not forget that you choose to Compete with enemies or allies to hurt an enemy player. Enemies will not cooperate with you, but you can waste one of their cards with the Competition. If you must ensure that you will damage another player, target an ally with "Rouse the Tiger." Realize that this is an expensive way to cause damage (your team loses two cards in the Competition), but it is ensured damage if the teammate cooperates. Finally, you can use "Rouse the Tiger" to hurt yourself and let a teammate 'refill' their hand.